January 10: Federal workers and supporters protested in Minneapolis. MINNEAPOLIS — As the Labor Review went to press January 18, the partial shutdown of the federal government brought on by President Donald Trump’s insistence on funding for an ill-conceived border wall was at the 28-day mark — and some 800,000 federal workers were about to miss a second paycheck. One week earlier, federal workers and supporters gathered on Hiawatha Ave. in Minneapolis near the Veterans Administration Hospital to protest the shutdown as part of nationwide rallies January 10. “They’re holding our pay hostage, preventing us from doing our jobs,” said Gregg James, Minneapolis, national vice president for American Federation of Government Employees District 8. “Shutting down the government is not going to solve any problems,” he said. Past federal government shutdowns, James noted, involved budget disputes — not policy disputes. The President and Congress need to find some other way to leverage negotiations, he added. 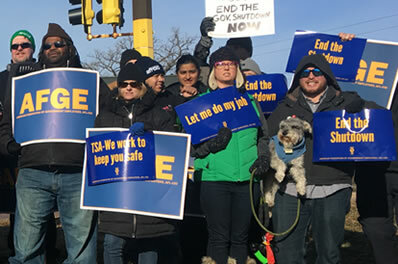 “We shouldn’t be the ones who suffer from their lack of cooperation,” commented Celia Hahn, Eagan, president of AFGE Local 899, which represents Transportation Security Administration officers in Minnesota, North Dakota and South Dakota, including 500 at MSP Airport. “Our paychecks are not bargaining chips,” she said. In Minnesota, the shutdown is affecting an estimated 5,470 federal employees. President Trump, meanwhile, has threatened that the partial federal government shutdown could go on for “months or even years” if he doesn’t get his way and get $5.6 billion for a border wall. “We all know what the President says; it doesn’t sound like he’s in any hurry to resolve anything,” Hahn said. Inconceivably, some federal workers whom the Trump administration deems essential — including TSA officers — are expected to show up and work even though they’re not getting paid. Hahn is continuing to report for her work as a TSA officer, too, a job she began 16 years ago after the 911 terrorist attacks. Many other federal workers, on the other hand, have been furloughed. “A furlough means we’re not allowed to do anything work-related… whether it’s an essential task or not,” said Sara Bergen, Minneapolis, who works for the federal Department of Housing and Urban Development in Minneapolis as a multi-family housing underwriter. Bergen is a 17-year member of AFGE Local 3419. “The first day of the shutdown we had four hours to close down our workstations,” she reported. And, she added, she and her colleagues were given word-for-word scripts to use for their outgoing voice-mail messages and their e-mail auto-reply messages.